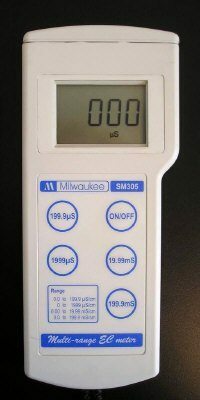 The Mi306 EC/TDS/NaCl/Temperature Meter is a versatile water tester with a variety of field applications. Gives quick, accurate readings. Features Hold function to freeze readings for easy and accurate recording. Stores up to 250 data records. User selects from Automatic Temperature Compensation, Manual Temperature Compensation, or No Temperature Compensation. This unit is lab tested and quality assured. Includes hard case, MA814D/1 Conductivity Probe, RS232 Connection Cable, starter calibration solution, and 9V battery.